Twenty six years ago tomorrow, (Feb. 24), country singer Webb Pierce left this life at the age of 69. But his songs still haunt us today. Born in West Monroe, Louisiana, he became one of the greatest honky-tonk singers of the 1950s. He also knew the value of building his image. As his bio at the Country Music Hall of Fame says, "he is perhaps as well remembered today for his silver-dollar studded autos and guitar-shaped swimming pools as for his great music." 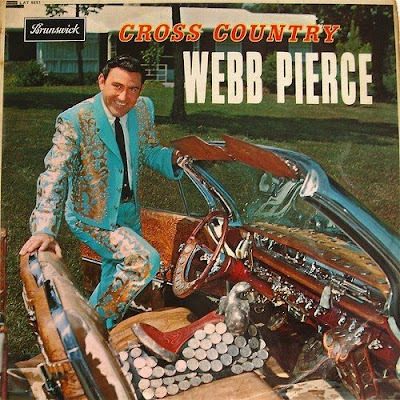 But let's not forget Webb's music -- his high-pitched voice that that just radiated heartarche. We'll start with one of his classics, or as Webb would say, one of the songs "that the people request most." This one is another unforgettable love song by Webb. This one's one of my favorites.